VW Transporter T6 Parts and Accessories supplied and fitted by Van-Tech Sportline Side Bars, Black Aluminium Roof Rails, Privacy Glass Windows, Barn Door Spoiler, Rear Carbon Bumper Protector and DRC DRM Alloy Wheels! Here are the individual parts thats we fittted to this vehicle they can be purchased from the links below or from our retail store in Halesowen, B63 3EB. 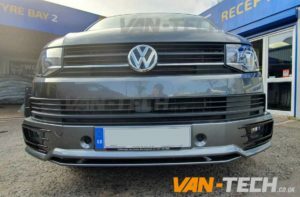 VW T5 T5.1 Side Bars SWB LWB Transporter Black Sportline O.E Style Side Bars are the perfect combination of great looks and practicality with a stylish finish and designed for T5 T5.1 Transporter Vans. Sold complete with the fitting kit and detailed instructions, you won’t need to drill your roof as these roof rails fit to the existing original fixing sites on the T6 Transporter. The DRC DRM is an 18″ mesh design with OEM styling, ideal for VW Transporter T5 vehicles. This wheel now features an on-trend gunmetal finish. 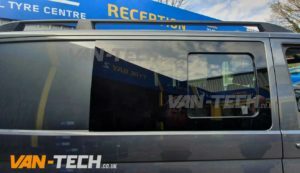 These high quality VW T6 Privacy Glass Tinted Windows 1 x Drivers Slider 1 x Fixed Passengers will be ideal for anyone looking to convert a Commercial van in to a Camper van. This VW T6 Transporter Rear Bumper Protector Cover Carbon Fibre is made to the highest standard when you buy and fit these you’ll appreciate the solid quality knowing that you won’t have any problems. These stylishly designed Sportline Front Bumpers Spoiler are not universal fit they are tailor made exclusively for the VW T6 Transporter. 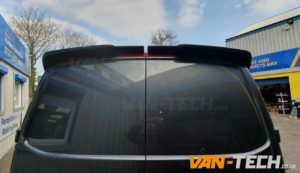 This VW Transporter T5 T6 Rear Barn Door Spoiler primer is stylishly designed and ready to paint made exclusively for VW Transporter T5 model years 2003 – onwards. We can get these spoilers painted colour coded to match your van for extra cost, call us on 0121 550 4628 for details. 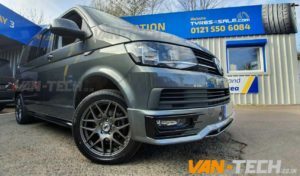 Check out the pictures of this Transporter T6 to see what a difference a few new Van-Tech products could make to your Van!